Mug rugs are not only functional, but also a fun way to dress up your desk or table. Use your applique skills to make this mug rug that makes us wish we were on a ship with the ocean breeze in our face. "Mug rugs remain so popular! For the past couple years they are by far my biggest pattern sellers. This is probably for many reasons. They are super easy to make, they can be made using your favorite techniques (hand or machine), they make great gifts, and they can be decorative as well as functional. Most of all, they are so much fun!" "I always think of my dad as an old sailor, which is funny because he’s the youngest 76 year old I know. 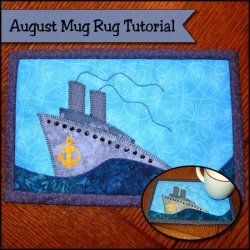 He is the inspiration behind this ship mug rug. Back before I was born he spent many years with the United States Navy. Maybe that’s where I get my love for the water?"